If I could single out a restaurant that exemplifies the growing trend toward more healthy organic foods, it'd be CoreLife Eatery. Fast casual? Check. A menu of various bowl-centric entrées? Check. An overabundance of kale and quinoa? Check. Their rapid expansion throughout the country proves that the average restaurant patron is becoming a bit more discerning about their quick eats, and CoreLife is there to provide protein, brown rice and Brussels sprouts. 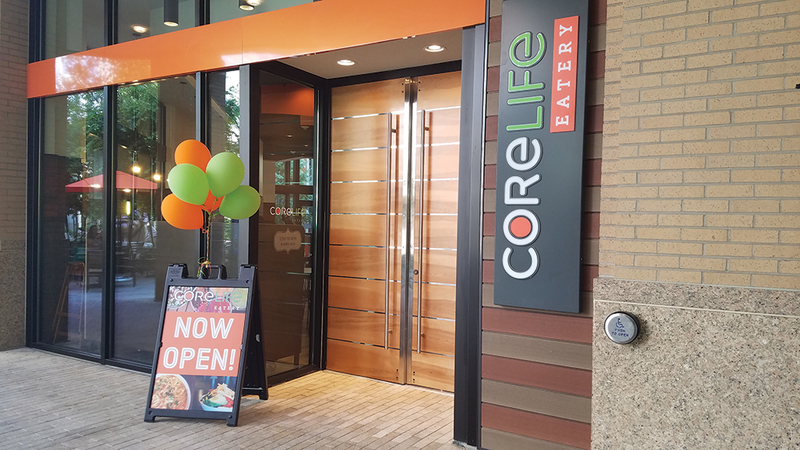 With four locations along the Wasatch Front, CoreLife has recently opened a fifth in the City Creek Center (51 S. Main, Ste. 153, 385-259-0395), adding to its already eclectic list of dining options there. Anyone looking for a lot of "power" food can check out the new eatery daily from 11 a.m. to 9 p.m.
My eyes tend to glaze over if someone mentions the words "Major League." While it's the name of a mediocre movie, it's most often associated with sports. In the case of Snowbird's second annual Bratwurst Eating Contest, however, major league means something a bit closer to my heart. Each year, Major League Eating—yes, it's a national organization and it's tremendous—gathers the country's finest professional eaters and tests their mettle in gastronomical combat. This year, reigning champion Gideon Oji defends his title against four challengers at the picturesque backdrop of Snowbird Ski Resort in Little Cottonwood Canyon during Oktoberfest festivities. Will Oji retain his crown? Or will another competitor walk away with the $2,000 first prize? Only time will tell. Brats will be consumed at 1:45 p.m. on Saturday, Aug. 25, in the Snowbird Center Event Tent. Speaking of beer-centric events, Tracy Aviary (589 E. 1300 South, 801-596-8500, tracyaviary.org) hosts an evening of education and drinking—two activities that are seldom paired. Fisher Brewing Co. provides the adults-only beverages while Jess Dwyer of the International Dark Sky Association discusses dark skies, energy conservation and avian migration patterns. Attendees will also rub elbows with members of Tracy Aviary's conservation team and astronomers from the University of Utah while using high-powered telescopes to marvel at the cosmic ballet beyond our atmosphere. Tickets are $15 and can be purchased at tracyaviary.org. A portion of all beer sales support the aviary. The event runs from 7 to 10 p.m. on Friday, Aug. 31. Quote of the Week: "I started eating competitively because I was talentless in all other realms of competition."